# Whisk the mixture of castor sugar and eggs in a deep bowl, until the mixture turns into white totally. Add orange juice, vegetable oil, sifted flour, baking powder and yogurt on it. Whisk the mixture for a while, until it smoothens. # Grease a small cake mould. Pour the prepared cake mixture into the mould. Place the mould into the oven, which is preheated to 347 F for a while, and bake the cake for about 30-35 minutes. # While baking the cake, prepare the syrup. Pour the orange juice and granulated sugar into a small pot. And cook it, until it reaches to the boiling temperature. Remove it from the stove and let it cool down. # Rest the cake, which is removed from the oven, for 3 minutes. Then, pour the cooled syrup all over the cake. When the cake soaks the syrup, reverse it over a service plate. # Rest the cake for about 2 hours. Finally, slice and serve it. 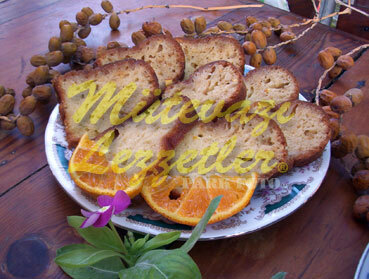 Note: For increasing the orange taste in the cake, you can grate rind of an orange into the syrup.